Today, we can find answers for the fundamental question of what it means to be human that claim to cast doubt on the essential reality of our humanity itself. The Qur’an, however, affirms our humanness and describes four aspects of the human—our physical creation, our spirit, our natural disposition (fiţrah), and our light—all of which have an unmediated origin from God and combine to make the human a distinctive and special creation. This indicates that the human being began his journey as a physical creature with the direct, unmitigated creative act of God. Without this distinction, there is much the human shares with other creatures. For example, “God has created every beast from water. Among them are those that creep upon their bellies, those that walk on two legs, and others that walk on all four” (24:45). Like the birds, the human walks on two legs, although his erect torso and upright gait still make him unique. While birds walk upright, their torsos are either parallel to the ground or face downward at varying angles. As mentioned above, the most notable physical distinction of the human is his ability to stand permanently upright. God says, “Do you reject belief in the One who has created you from dust, then from a clot, then made you an upright man?” (18:37; also 82:7, 32:9, 38:72). A nonphysical reality—namely, sociability—accompanies this unique physical distinction. We read in the Qur’an, “Remember the favor of God upon you, how you were enemies, and He placed sociability between your hearts, and you became, by His blessing, brothers” (3:103). This sociability is predicated, in part, on the upright stature of the human. His heart always points outwards. As a result, when he embraces another human, the hearts of two are joined, establishing a metaphysical connection between them. For this reason, the Prophet ﷺ has warned the believers, “Lā tadābarū (do not turn your backs to one another).”6 When believers turn their backs to one another, their hearts also turn away, breaking the metaphysical connection—a connection established by God and facilitated by their upright posture—between them. While his uprightness may lead the human to exalt in what could be viewed as a unique virtue, aspects of his physical creation should also lead him to humble himself. For example, in the Qur’an, God reminds us, “Does not the human see that We made him from a drop of sperm? Then lo, he becomes a rebellious disputant who sets before Us parables and forgets his [lowly] origin” (36:77−78). We are reminded by some who comment on this verse that our beginning, in a sense, originates from the same channel that urine exits our bodies. How could such a creature behave arrogantly? If Imam al-Ghazālī does accept the idea of a composite human—body and soul11—it is an idea that is deeply rooted in the Qur’an. For example, as mentioned above, the Qur’an reminds us that the spirit is a distinct nonphysical creation breathed into the physical body (see 32:9, 15:29, 38:72, 21:91). The spirit and the physical body of the human, this means, were two distinct entities when they were brought together. The Qur’an does not indicate that they lose their individual natures upon uniting. Additionally, many hadiths clearly indicate that the spirit enjoys an existence that is distinct from the body, both before and after physical life. For example, “The spirits are varied troops. Those who knew each other [precorporally] find familiarity, and those who were ignorant of each other find disharmony.”12Many scholars use this narration as a proof that the spirits were created before the body. After the spirit enters the body, those who knew each other in the precorporeal realm experience familiarity upon meeting in this world, whereas those who were unknown to each other in that realm sense an estrangement upon meeting in the world.13 As for the fate of the soul after death, we are told, among other things, that the spirits of martyrs live on in the bodies of green birds in Paradise.14 These and similar narrations make it clear that the spirit has an existence distinct from the body. Once the human has been animated by the spirit, he can undertake his primary purpose: namely, to worship and to know his Lord. We read in the Qur’an, “I have not created the jinn and humankind except that they worship Me” (51:56). 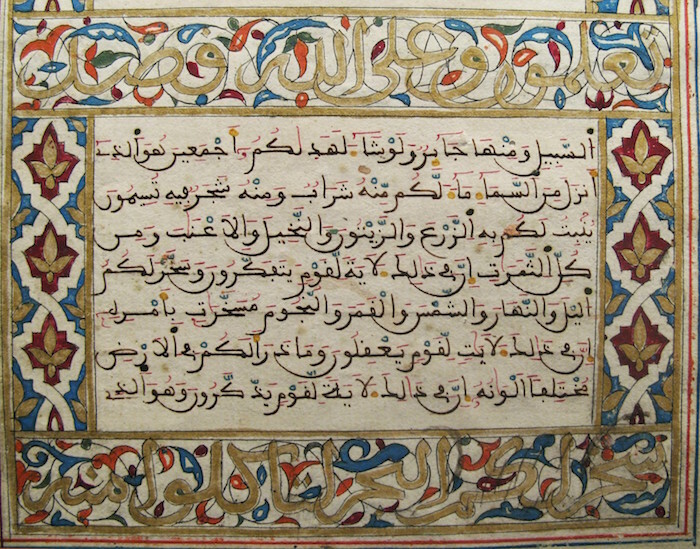 Many Muslim exegetes mention that this verse can also be interpreted to mean “that they know Me.”15These two meanings are consistent with the nature of the human, as worship involves bodily actions associated with the physicality of the human, while true knowledge of God requires a metaphysical process. A third aspect of the human in the Qur’an is his natural disposition, which is described by the Qur’anic term fiţrah. Like the physical creation and the spirit, the fiţrah proceeds directly from God. We read, “Orient your face towards the true religion, in accords with your natural disposition. [This is] the nature of God, upon which He has fashioned humanity. Let there be no alteration in the creation of God. That is the upright religion; however, most people realize it not” (30:30). In this verse, God mentions that He has fashioned the human upon His nature. We can understand this as referring to, among other things, His waĥdāniyyah (oneness).16This means that humans are fashioned to readily recognize that oneness, unless they have been removed from their natural state. This understanding is supported by the verse “I have not created the jinn and humankind except that they worship Me” (51:56), as well as the verse, “When your Lord brought the descendants of the Children of Adam from their loins, and caused them to bear witness against themselves, ‘Am I not your Lord?’ they said, ‘Certainly, we bear witness,’ lest they should say on the Day of Resurrection ‘We were heedless of this’” (7:172). In this verse, God describes the descendants of Adam, peace be upon him, as extracted from his loins and then called to bear witness to the oneness of God. This pretemporal event imprinted upon human consciousness a natural disposition toward monotheism. Hence, “[this is] the nature of God, upon which He has fashioned humanity.” The dross of the world, which envelops the heart in darkness, leads many humans to reject their very nature, turning them away from God. Revelation and prophetic teachings remove that darkness and allow humans to reaffirm the pretemporal covenant of monotheism, thereby returning to their natural state. Likewise, “One for whom God does not make light, he has no light” (24:40). The light referred to in these verses has variously been described as the “actualized knowledge of God,”17“the light of insight,”18 “a light given by God to the believers after their resurrection,”19 “the light of Divine Oneness,”20 “the light of obedience,”21 and “the light of guidance.”22 The prophetic tradition, however, introduces narrations that allow us to view this light from another perspective and to understand its divine origin. One of the prayers made by the Prophet ﷺ is the following: “O God, make light in my heart, light in my vision, light in my hearing, light to my right, light to my left, light before me, light behind me, make a light for me.”23 Another version adds, “and light in my hair, light in my skin, light in my flesh, light in my blood, and light in my bones.”24 This prayer was not just personal for him: it is instructional for us. The Prophet ﷺ prayed to God that he be made into a being of light, and he taught us to make that prayer. This could mean that he was praying that the light of his spirit be reflected in his physical nature. Our physical nature can indeed be infused, by the will of God, with light. When that occurs, like the angels, who are created from light,25 we readily recognize the purpose of our creation and become monotheistic, obedient servants of the One.